Established in 1995, we are a specially designed fitness centre with digital air conditioning, sound proofed walls, top quality equipment, and world class trainers. We are a 24/7 Service with a wide range of services on offer. 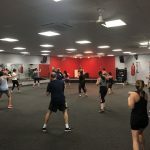 Everyone is welcome at our gym – you won’t find hordes of body-builders eyeing off how you exercise – it’s a family gym for anyone who is interested in getting fit in a fun and friendly environment, whatever your fitness level! We offer a fully equipped gymnasium, free weights, cardio equipment and range of Les Mills group fitness classes including, RPM, BODYBALANCE, BODYSTEP, YOGA, BODYATTACK, CXWORX, BODYPUMP, GRIT Strength, GRIT Cardio, STEPEXPRESS, SPRINT as well as a FAT BURNER CIRCUIT and our very own NO EXCUSES. We have great membership options including corporate, government, student and senior discounts available.